Today’s visit was to firstly check all was well with hive 7 following the hardware change at the weekend and seconding to feed the colonies. Hive 7 looked OK and the bees were flying which was good news. The air temperature was 10°C and cloudy so although not an ideal time to feed there were not a lot of flying bees so the opportunity to give each hive a gallon of sugar syrup in a contact feeder was taken. The sugar syrup was 1:1 strength i.e. 1 litre of water for each kg of sugar. The image shows the contact feeder in situ on a cover board, the white stuff in the corner is the remains of hardened fondant that was fed to the colony in January. The issue with the large contact feeder is that you need a brood box to stand it in. Varroa boards were also fitted into each hive, they will be left there for a week so that we can attain a spring varroa drop count. 11:00 am on 11th April 2010 will see the opening of the Apiary with all members welcome, there are a few housekeeping jobs to be carried out to ensure the Apiary is fit for the season, followed by a BBQ. What a difference a week makes, spring is here and pollen is pouring in the hives. A sure sign that there is a laying queen in the hive. The mouse guards were removed along with a quick check inside the hives to evaluate the stores situation. We will wait a while before doing a full spring check on the colony. The weather has been warm all week and today was particularly nice, so it was decided to give Hive 7 new woodwork to replace the woodpecker (picus viridis) damage from earlier in the year. 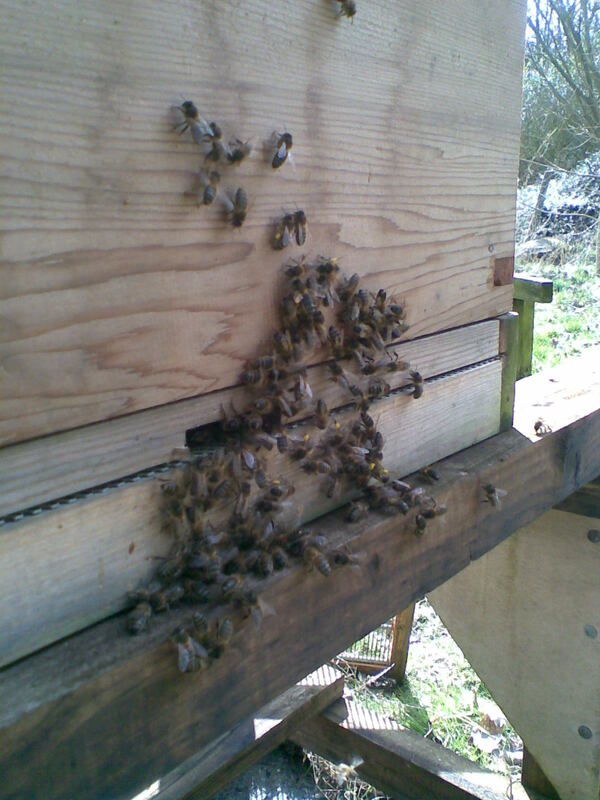 The photo shows the bees getting used to their new entrance, note all the pollen in the bees pollen baskets. The late arrival of Spring and the poor weather over the last couple of weeks has taken its toll on the apiary, the colony that has been weak all winter and which I felt was going to survive through succumbed. The hive was closed up to prevent robbing and the spread of disease until a vehicle can be brought to the apiary to remove the hive. 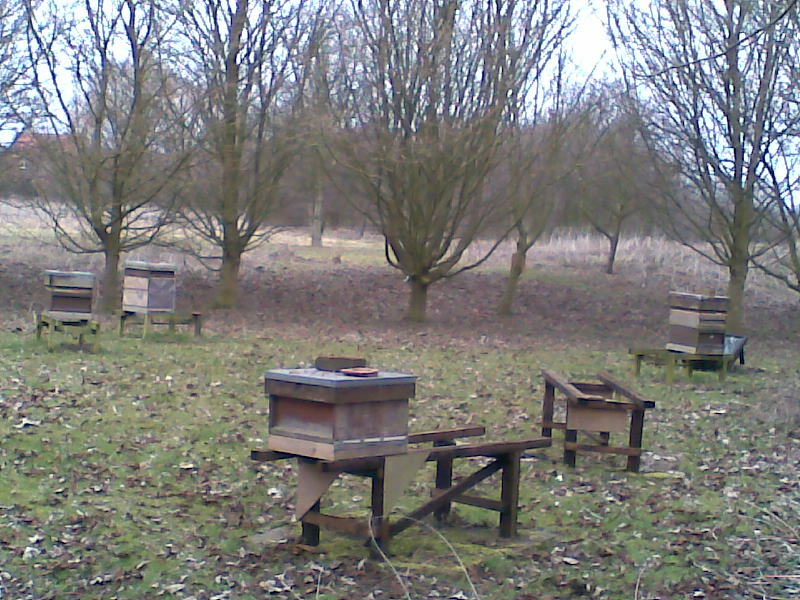 This week’s photo shows a an empty looking apiary, the dead colony is in the hive to the far left. So the apiary is now down to three colonies, which means we will look to make increase over the coming season. Let’s hope spring comes soon. Note that the netting has been removed from the hives, let’s hope the woodpecker(s) do not return. Hive 7 is the far hive with the plastic sheets and temporary boarding to maintain the weather proofing of the hive. You are currently browsing the Mid Bucks Beekeepers Association Blog blog archives for March, 2010.